These smoke hoods are one-time use respiratory devices that assist users with breathing while escaping a fire. 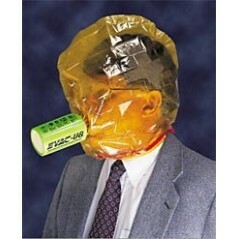 They include a transparent plastic hood that covers the user's head, and a canister that filters out toxic gases. "EVAC+™" or "EVAC-U8™" is printed on the canister. The Award-winning multi-stage catalytic filter and compact design of the Evac-U8 hood provide a high level of protection and value for frequent travelers. Its ability to remove carbon monoxide makes it especially valuable in high-rise hotel and office building fires, where carbon monoxide is the biggest threat. Protect yourself from toxic smoke, the number one cause of fire fatalities. It may look strange, but this emergency escape hood gives you 15 life-saving minutes to escape a fire with your lungs and eyes protected from painful smoke and toxic gasses. Just twist open the compact canister, bite down on the snorkel-like filter, and pull the heat-resistant Kapton hood over your head. * EVAC-U8™ is a portable air-purifying Respiratory Protective Escape Device (RPED). 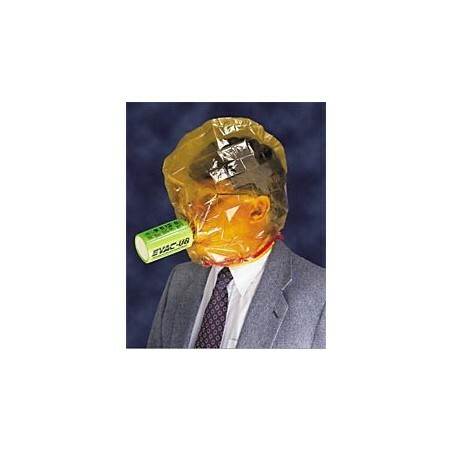 * It provides respiratory, head and eye protection for 15 minutes* to assist escape from hazardous fire atmospheres. * Catalytic filter system provides protection against toxic gases created by fire including Carbon Monoxide, the #1 killer in fires. * Heat-resistant hood (made with Kapton® polyimide film, a DuPont material) protects head and eyes, allowing you to see and hear. * Compact size and light weight (approx. 11oz/312g) makes EVAC-U8™ easy to store and very portable. * Universal fit - not affected by eyeglasses, hair length, facial hair. No fit testing required. * Requires no maintenance (other than visual inspection) during 5-year service life. * Easy to use - requires minimal training. Essential protection anywhere a fire could occur! There is a missing link in the chain of survival. The missing link to reduce the number of deaths falls between detection and suppression. That link means MOBILITY - getting out alive. The role of the EVAC-U8™ is to provide that mobility to assist in safe escape from smoke and fire emergencies.